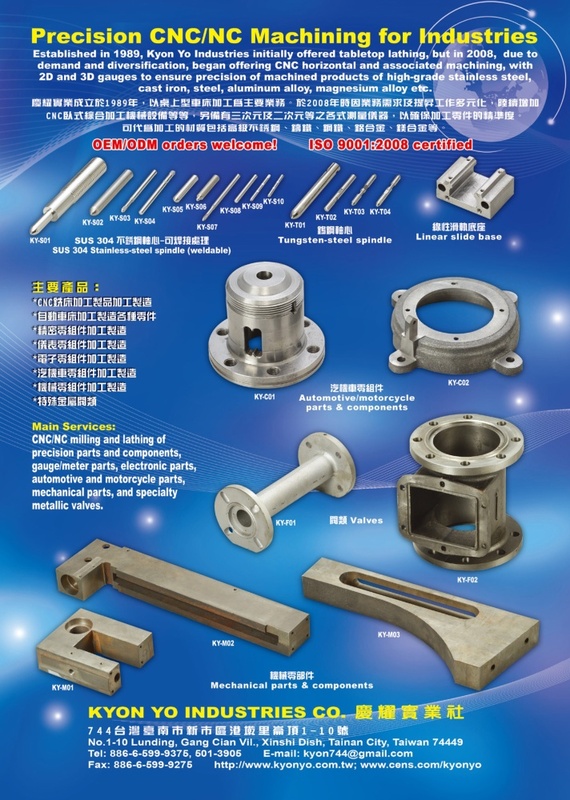 Established in 1989, Kyon Yo Industries initially offered tabletop lathing, but in 2008, due to demand and diversification, began offering CNC horizontal and associated machining, with 2D and 3D gauges to ensure precision of machined products of high-grade stainless steel, cast iron, steel, aluminum alloy, magnesium alloy etc. ISO 9001:2008 certified to offer safety-guaranteed production, we strive to provide even better, more satisfying machining quality and broader services. Manufacturers and traders in Taiwan and overseas are welcome to inquire about joint venture.